Both the wife and I shoot Uberti 73's. We have replaced the stocks with flat buttstock. About a year ago we picked up a 73 carbine (like Eqanimous Phil mentioned above) for a back-up. The buttstock is comfortable right out of the box and it's a little lighter gun. 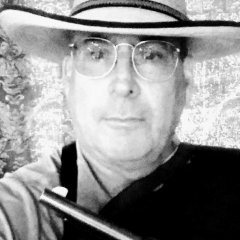 Captain Bill gave you some good recommendations for some sources of rifles that are available from well known gunsmiths. These rifles are new and have already been tuned to be race ready. Because these smiths buy in quantity, you can buy a "race ready" gun that has been tuned and has upgraded parts for a little more than a new "stock" rifle would cost you from a distributor like Cimarron or Taylors. If you buy a stock gun, you will be buying a short-stroke kit and other parts to help you be competitive and then you will have to find a good gunsmith to install the parts and time the gun properly. That will cost you hundreds more than buying a tuned new gun from one of the well known smiths. Some people in this sport are very knowledgeable and can do all the work themselves. Unfortunately, I have to defer to good gunsmiths. I'm running Dillon dies in the 650 followed by Lee factory crimp die in the last station. The dies are about 6 years old. At first I was running RCBS dies in the 650. Lumpy, they weren't all the same head stamp, but almost all were uncommon brands. The first couple of years I sorted all brass by head stamps, but I started shooting more matches each month and my wife started shooting, I quit sorting brass. Lumpy, he will check the head space. We had both our main match rifles checked last year when we had new bolt assemblies installed, but you never know, things may be out of wack now. Thank's guys! 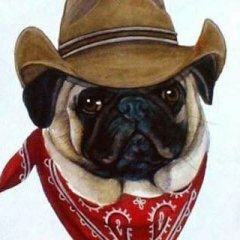 Some very good information and thank's for the detailed PMs. Lumpy, I just talked to my friend and top-notch cowboy gunsmith earlier today. The lever safety is going back in the rifle. A few years ago, he developed (or learned from someone else) a way to make the lever actually gently spring closed when it gets about a 1/4" from being totally closed. I have his system on two rifles he has worked on and it works flawlessly. I'm going to have him put this system in my current "problem child". Lumpy, I'm a wet tumbler guy. The rifle is an older Codymatic. At the time I bought it new, most smiths were disabling the lever safety. Both of my newer Cody's have functional lever safeties. I don't think I am firing out-of-battery, because I don't put my finger on the trigger until after I close the lever. It could be a possibility, but I don't think so. My wife has the identical rifle, with the lever safety, and it was experiencing the same problem before we used the chamber scraper. I do receive regular lectures from my friend and local cowboy gunsmith about the lever safety. If this issue continues, I will, begrudgingly, re-install the lever safety that my gunsmith friend gave me, or, I'll buy a new 1866 so he stops nagging me. About a year ago both my wife's .357 1873 rifle and mine would occasionally experience a piece of sticky brass that was very hard to lever out. I purchased a Slix Chamber Scraper and was a little more diligent with my cleaning regiment and the problems went away. Recently, however, about once a match, I get an empty that requires extreme effort to eject. I'm not as young as I once was, but I'm still a former college wrestler and linebacker. Nothing ruins a good rifle string like having to fight with a rifle lever. I was stumped. The chamber was clean; no trace of a carbon ring from shooting .38s in a .357. After experiencing another sticky piece of brass in yesterday's match, I took all the empty rifle brass from yesterday's match and dropped each one into a .357 chamber checker. Approximately 6 of the 120 pieces had trouble dropping into the chamber checker. I was unable to push one piece into the chamber checker, even with considerable force. I had found the culprit! Each of these pieces of brass seemed to be slightly bulged near the bottom of the case, near the rims. I admit to being a brass "hoarder" I have a full 5 gallon bucket of mixed brass .38s and at least a 2 gallon bucket of nickle plated .38s. The nickle stuff seems to split more easily so I only use those in revolvers. I started testing other brass from the big bucket and I started finding more brass that wouldn't fit in the chamber checker. I know a number of shooters who only shoot one brand of brass (normally Starline) and get rid of it after a certain number of reloads. I don't know if I'll go to that extreme, but I will start checking all my brass with the chamber checker, before, and after, I load it. I haven't had problems with loaded rounds (probably because I run it all through a Lee Factory Crimp Die). I'm assuming that some of the older brass is getting weaker and the resizing die and the Lee Factory crimp don't resize the last bit of the case near the rim. I've done this for a couple of years with my shotgun shells for my SKBs and sticky hulls are no longer a problem. My doubles prefer Remington STS and Nitro hulls. I'm sure I'll discover which brass functions the best in the rifles also. I just mention this in case any of you have experienced a similar problem. Just when I think I have pretty much everything figured out some other "gremlin" appears. +1 for Yul and Lost Vaquero. I only have one left and it's a .44-40 Pedersoli. The two other Lightnings I have owned have been Pedersolis and they have been trouble free. You really don't dunk the holster. Run some cool tap water on it and in it for just a minute or two. Shake off the extra water. I wet fit my holsters before I dye them. Another holster maker friend dyes his holsters before he wet fits them. He stated that the water may lighten the color a little. I only wet fit my holsters once. I would be careful not to do it too often. Mr. W, As a leather maker, when I wet fit holsters, I use a waxed hammer handle to shape the bottom part of the holster. I sometimes need to give a little more attention to the place the sight touches. 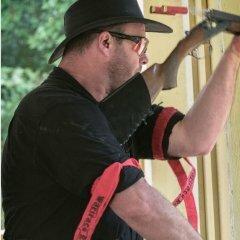 At the local clubs I shoot at we have experienced posse leaders who will specifically ask people to spot, pick-up brass, or work the unloading table. I'm normally the guy doing the rule briefing and I make a point of talking about being a good worker. I know that I and other experienced shooters who have introduced the sport to new shooters have emphasized being a good worker at the start as a way to gain acceptance and status in the group. My wife didn't start shooting until years after I started, but now is a competent gunfighter and probably one of the best brass wranglers in SASS. As older members have aged, they are not capable of doing heavy work, but anybody can work the unloading table or spot. Set-up days are a separate issue. Those of us that are still working full time jobs can't make many of these days. Normally there is a group of retired guys that take on this responsibility. What has happened to us locally is that this a small group of guys and several of them have now reached the point were they can no longer move steel. It's a real problem. When I started, early on, I didn't have high regard for those shooters who finished the stage and sat down on their cart to have a smoke and BS with other slackers or moved on to the next stage to get ready to game the next stage. Funny, recently, less of this group of people are smoking and more are playing on their smart phones. As an educator of 43 years, I know that shaming people, that aren't required to attend, is a sure way to run people off. Positive comments, modeling good behavior, and humor often work better. I'm fortunate enough to regularly posse with a number of outlaw shooters like TN Tombstone and Loose Cinch. I'm a respectable gunfighter, but I'm in awe of these guys when they can pull off multiple crossovers. Normally Tombstone will say something to me like, "watch and learn" and proceeds to be very entertaining. There is no speed advantage to crossovers; in fact it takes much more time. The style points are well worth the extra seconds. Newer Uberti 1873s rifles have an upgraded bolt assembly. The bottom bolt tab is now replaceable. Both my wife's rifle and mine have had broken bottom bolt tabs. Until recently, all Uberti 1873s have had a lower bolt tab that was part of the bolt. If I was putting together a parts supply for 1873, a new bolt assembly would be a must. A bolt assembly is a little over a $100 and is available from VTI, Cimarron, or Taylors. Please be aware that these are not necessarily drop-in parts. They need to be fitted and timed by a knowledgeable cowboy gunsmith, or someone who really understands these rifles. Very interesting. It's neat to find out the origins of people's alias. I found different varieties of ATV gun holders at my local Sportsman's Warehouse. I can't recall the brand I put on my baby jogger. I paid $34 dollars for a large 10 karat HS ring in 1969. I wore it for a month or two and then a couple of different girlfriends wore it on a necklace for a year. I quit wearing it in college and it sat in a cigar box until the late 1970s. Gold went way up in price and I sold it for $100+ which I used to buy some good competition darts. I still have those darts. We got married in 1977 and my wedding ring tried to take off my finger twice. Once while lifting weights and once while working in my parents metal shop for a summer. The wedding ring languished in my wife's jewelry box until 10 years ago. Gold was up again and my wife was cashing in some scrap gold. She tossed me my ring and said, "I'm not worried about you anymore, why don't you sell it"? I added the cash with some more money to buy a new pistol. I still have that pistol.